There are several types of transportation you can use to get from Copenhagen, Denmark, to Malmö, Sweden, and back; the distance between the cities isn't far. Your transportation options can usually be booked in advance, but each option has pros and cons. Copenhagen is the largest city in Scandinavia and a is a popular tourist destination and port of call for passenger ships. Malmö is Sweden’s third-largest city with a castle and enchanting old town center. In contrast, Malmö has a redeveloped waterfront with promenades and has Scandinavia's tallest building. It's a progressive, vibrant town. The Oresund Bridge links Denmark and Sweden and was completed in 2000. The $4 billion bridge/tunnel project consists of a 5-mile bridge, 2.5-mile tunnel, and a man-made island. 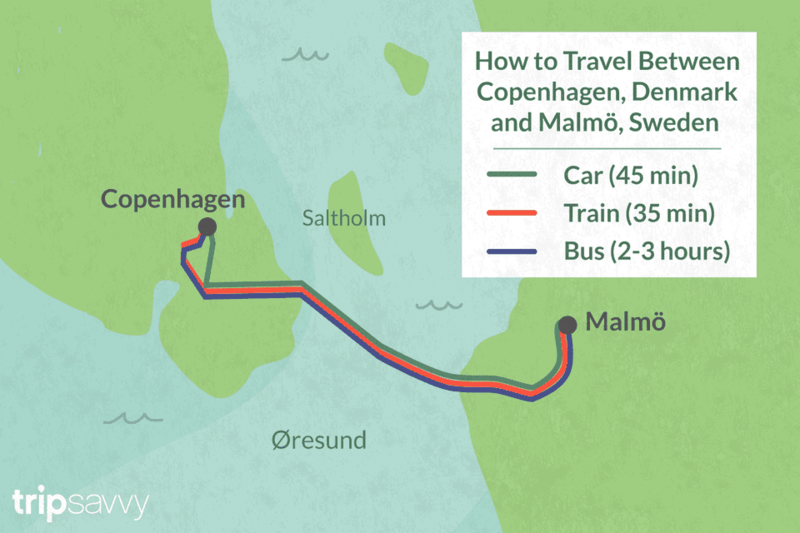 Here's a closer look at four ways to get between Copenhagen and Malmö. Taking the train from Copenhagen to Malmö is a popular option and only takes 35 minutes across the famous Oresund Bridge. The train departs either city's central train station every 20 minutes and stops intermittently at locations such as at Copenhagen Kastrup Airport. The advantage here is a flexible schedule and low price since you won't have to pay a bridge toll. You can purchase your ticket locally or order flexible train passes for Denmark and Sweden at RailEurope.com before you go so you don't have to worry about getting tickets. If you'd like to rent a car to get from Copenhagen to Malmö, it's a 45-minute drive (45 kilometers or 28 miles). Simply take the E20 across the Oresund Bridge (54 euro toll required). It's a beautiful and memorable drive through the tunnel and across the bridge, but you'll pay for gas and the bridge toll. If you are going to be traveling across this bridge more than a couple of times, you can purchase a Bropas (bridge pass), which will give you half-off pricing. You can also save by using the "SmutTur" (getaway) discount which is available all weekdays from 5 p.m. to 12 a.m., as well as all day on weekends and holidays when you return within six hours. The six hours begin when you pass the toll station on the Swedish side. Here's probably the cheapest option: Take the Flybus 737 from Copenhagen to Malmo across the Oresund Bridge. It's a direct bus line commuting between the airports of the two cities and also coincides with Ryanair flight arrivals from the UK. From Copenhagen, the bus to Malmö departs on Ingerslevsgade. In Malmö, you'll find the bus to Copenhagen right outside Malmö airport. You can also take the Greyhound bus (Gråhund). Look for bus line 999. You can also take a guided bus tour from Copenhagen to Malmö, such as the Swedish Day Trip from Copenhagen (unfortunately, it's not available year-round). This full-day tour contains bus and ferry transportation and guided group sightseeing of the Copenhagen-Malmö region. Malmö is located in between Malmo Sturup Airport and Copenhagen Kastrup International Airport, so flying from Copenhagen to Malmö or back doesn't really make any sense. You can fly directly to either Copenhagen or Malmö from other cities in Europe and then start your exploration of these two interesting and vibrant cities joined by a bridge that is a marvel of engineering.